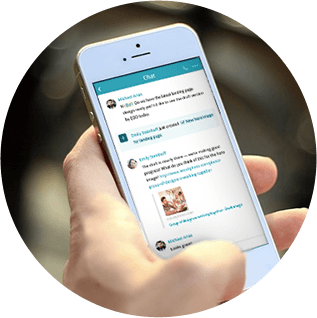 Finally — a business communications and collaboration platform that can keep up with your team! When there’s no more time to waste, Redbooth is there to consolidate and streamline your work. Redbooth is a business communications and collaboration platform where team members can instantly connect with built-in chat, HD video conferencing, screen sharing, conversations within tasks, and now one-click voice calling. Redbooth boosts productivity and lets your team take back hours each day. Instantly connect with anyone on your team with built-in real-time messaging. Chat with the whole team, or privately one-on-one. You can seamlessly transition a conversation from desktop to mobile with Redbooth’s mobile apps. All chats are archived and fully searchable, so you never have to worry about losing an important conversation. Collaboration is more than just communication — it’s about having instant access to the right communication tools at the right time. With Redbooth’s business communications and collaboration platform you can now escalate the conversations that are better over a voice call without ever leaving what you’re working on. Simply hover over any name or avatar and connect instantly with a one-click voice call. Offered to all Business-tier customers free through the end of the year. Redbooth increases transparency and accountability for everyone and causes productivity to skyrocket. Sleek, comprehensive reporting allows managers and execs to easily access top-level data about performance, measure progress toward goals, and make accurate planning projections. Individuals can benchmark their own progress on tasks and projects, and share the workload with team members who have too much on their plates. Redbooth’s business communications and collaboration platform takes you beyond project management. Start for free today and see why thousands of companies are using Redbooth as their online team collaboration solution.